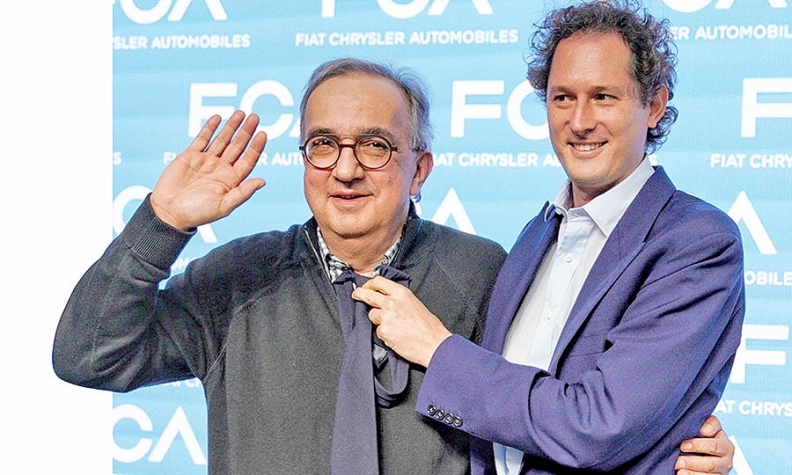 John Elkann, right, heir of the founding Agnelli family, has said an internal candidate will replace Marchionne at Fiat Chrysler. TURIN -- Fiat Chrysler Automobiles CEO Sergio Marchionne is to be replaced permanently at the helm of the automaker as well as Ferrari, after suffering serious complications from surgery, sources sold Automotive News Europe, Bloomberg and Reuters. FCA said earlier this month that Marchionne had undergone shoulder surgery and was in recovery. But the 66-year-old executive has since suffered "massive" and serious complications, according to sources. The boards of FCA and Ferrari are preparing to name replacements for him on Saturday, sources said. Automotive News reported on the board meetings Friday. Marchionne’s health condition, which the company hasn’t discussed in detail, speeds up the timeline for a succession decision. Marchionne turned around an ailing Fiat when he took over more than a decade ago, and he has been closely tied to the company’s success. Who will run the company is just the first of a number of pivotal choices -- like whether to remain independent -- facing Chairman John Elkann. Elkann, heir of the founding Agnelli family, has said an internal candidate will replace Marchionne at Fiat Chrysler. The three groups controlled by the Agnelli family are set to name internal successors for Marchionne’s jobs. Louis Camilleri, a former Philip Morris International chairman and a member of Ferrari’s board, will be named CEO of the supercar maker, with Elkann taking the chairman role, the people said. Truck and tractor maker CNH Industrial NV is set to name one of its existing board members as chairman, the sources said. Filling Marchionne shoes won’t be easy. The executive is considered to be one of the industry’s most skilled turnaround artists, not only saving Fiat from potential collapse, but later engineering its acquisition of Chrysler, which likely wouldn’t have received U.S. government backing for its 2009 bankruptcy without the involvement of its Italian partner. As recently as March, at the Geneva auto show, Marchionne was among the executives who refused to go along with a proposal by German rivals to issue a statement reiterating the industry’s commitment to diesel technology. “They didn’t get support from the others and were left by themselves,” he said then. He is also focused on brand building, spinning off Ferrari into a separate trading company, a move that’s built enormous value for the Agnelli family and other shareholders. Jeep, which produced about 300,000 cars in 2009, is now a global brand that will sell about 2 million vehicles this year after expanding in Europe, China, India and South America. FCA is scheduled to report second-quarter earnings on July 25. Chief Financial Officer Richard Palmer probably will lead the conference call, people familiar with the matter said earlier. Marchionne has been vocal for years on the industry’s need for more consolidation. His plan to create with General Motors the world's biggest carmaker was rebuffed in 2015. Since then, he and Elkann have concentrate on the company's more lucrative SUVs and higher-margin brands.